Search your library for a basic land card, put that card onto the battlefield, then shuffle your library. 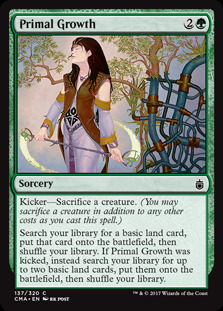 If Primal Growth was kicked, instead search your library for two basic land cards, put them onto the battlefield, then shuffle your library. 3rd time the charm, thanks for the compliments, Vash13! In an earlier iteration of the deck i played Life from the Loam - only to realize i don't have enough lands that sac themselves. 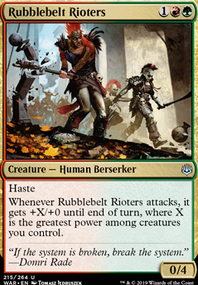 If i were to play with Crucible of Worlds , Scapeshift and a full suite of originial Fetches that would be one of the best cards the deck could have. At the same time getting all 6 Fetches and said cards would be an investment that would nearly double the deck's value - it is far more likely that im going to build another 1-2 decks with that money instead. I'd never cut Farseek and Rampant Growth , because both of them, Nature's Lore and Sakura-Tribe Elder are the best drops the deck has. 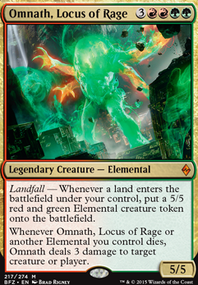 Either they allow me to cast Omnath, Locus of Rage a turn early or they make for cheap Landfall triggers. You're propably right about Primal Growth . I should find a slot for it. juiicyfruities on "Bite of Delirium"
I generally never add more than 2 of Arachnus Spinner because of the cost. If you're unable to take out any of your creatures or enchantments, then I guess the only thing that's left are the sorceries and lands. Probably 1 of Driven / Despair and 1 of Primal Growth . Then you could take out 1 Forest and 1 Grisly Salvage ? If you would be comfortable with that. Some cards I recommend cutting: Boundless Realms, Grow from the Ashes, Primal Growth, Coiling Oracle, Budoka Gardener. You can also replace the mana dorks since you will eventually ramp a lot more with the land drops. I would recommend Burgeoning as well as Ghost Town as a reuseable land drop. 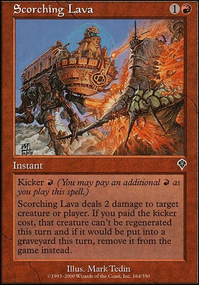 Mana rock accelerants would do a lot better than dorks in this scenario as you want Tatyova out as soon as possible. Update: Wanted to make the deck a bit faster, cutting out some "cute" cards, and add some toolbox stuff 1. Primal Growth OUT > Elvish Mystic IN 2. Mulch OUT > Satyr Wayfinder IN 3. 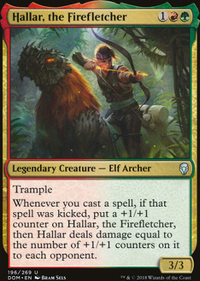 Viridian Emissary OUT > Llanowar Elves 4. Crop Rotation OUT > Arbor Elf 5. Solemn Simulacrum OUT > Priest of Titania 6. Crypt of Agadeem OUT > Homeward Path WHY: 1, 3 and 4 are some of the 1cmc mana dorks I want to test at the moment. I'll decide on only adding these because I don't want to change the deck drastically and these are the best ones in my opinion (Given that I don't have a Birds of Paradise currently available. Primal Growth and Viridian Emissary are slower ramps and they needed to be cut off someday. Crop Rotation is currently out because I don't have a lot of utility lands to search for, and it felt like a weird draw 80% of my games. 2 was an obvious change, really, since Satyr is way better given it's a creature. The only reason I didn't change it before is because I couldn't find that card in my collection since I put it on a forgotten corner after so many whiffs with it. 5 was a bold move, after I counted that almost 1/4 of my creatures are elves, I wanted to test Priest to see how well she performs, although I'm a bit unsure on that yet 6 happened because the crypt never seemed to make a huge difference on table. Most of the time, it was just a swamp that entered tapped, wasting a turn. I know Homeward Path produces colorless, but I believe its effect is worth the for this cost. Besides, there's Urborg, so once that's on the battlefield, at the worst case, we can tap it for black. Best case, we avoid dying to spells and effects such as Insurrection. And since creature stealing is pretty common on the format, I believe that this new addition will work out quite well in our favor. 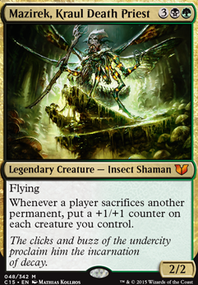 Get more ramp with Primal Growth and more card draw with Elemental Bond and Lifecrafter's Bestiary. I actively avoided adding Meren of Clan Nel Toth as everyone in my playgroup that has a deck of golgari colours runs her. I missed Primal Growth somehow so I'll maybe add her! I'm not a fan of Bone Splinters due to sorcery speed; and Diabolic Intent is too pricey for me unfortunately. Out of the second list you suggested I have variations of cards that do the same thing; which is also true for your fourth list of suggestions. In my first iteration of the deck I had Corpsejack Menace etc but I've found that I didn't need them for +1/+1 counters to get out of hand.